End to End is here to provide you with an affordable and reliable one-off cleaning service in London. We help commercial and residential homeowners to eliminate the source of clutter in just one visit. Our one-off service can be tweaked to your needs, tell us how and what needs cleaning and we will take care of the rest. Whether you need your house or flat deep cleaned, or just a quick bathroom scrubbing, you only pay for the scheduled time. What are the benefits of our deep cleaning service? We always tailor our services to the clients’ needs. So is with our deep cleaning in London. We follow all checklist tasks closely and everything that should be wiped, dusted, or simply cleaned, will be taken care of! Home cleaning after a long vacation. What’s more, you can have your service as soon as tomorrow! We have many teams of one-off cleaners located all around London, and we certainly have a reliable cleaner near you. Our service comes at one of the lowest rates in the capital. The prices for our one-off deep cleaning in London start from 12£ per hour for subscribed members, please view our prices page for more detailed information. As part of the spring cleaning service, you can have your entire property cleaned or just a specific room or area of your house. Make sure you mention you require a deep cleaning service when calling us or have the one-off cleaning service checked on the booking form so the cleaners will know your preference. Hallway – dusting all surfaces including skirting boards and woodwork. The front door will be wiped and cleaned. Bathroom – tub and sink will be descaled, and toilet disinfected. Polishing of all bathroom cabinets. Kitchen – wiping and cleaning of all kitchen appliances. Dusting of all cupboards, countertops, and tables. Bedroom – hoovering all carpets and rugs. Picture frames, light switches, wardrobes, and other surfaces will be dusted. Living room – tackling furniture pieces and vacuuming floors. Removing cobwebs and polishing windows. Note: The cleaners can use detergents and tools provided by you, but upon request, the cleaning teams will bring their own tools and equipment needed for the service. Have your carpets, rugs, and upholstery items cleaned as part of your one-off session at a 10% discount rate. Please visit our upholstery and carpet cleaning page for more information. You can also combine this service with home removals in London and make sure your relocating process goes smoothly. Depending on the time booked, we can help you with extra tasks such as dishwashing, laundry, and ironing of your clothes, at no extra charge. If you want these tasks to be completed, all you have to do is to include them in your dedicated cleaning checklist. 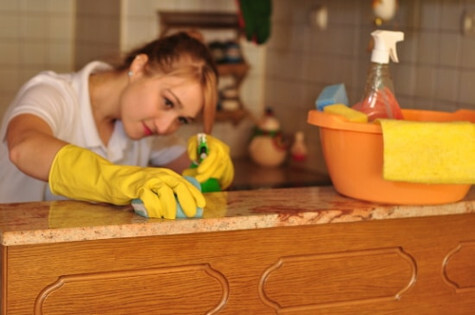 What’s the difference between an end of tenancy and a one-off cleaning? The pricing – the one off service is charged by the hour while tenancy cleaning is charged per job. The equipment – the one off cleaners can use your detergents or come equipped with such. For an end of tenancy cleaning, all detergents are always carried by the cleaning teams. The guarantee – our end of tenancy cleaning comes with a 3-day guarantee, while one-off cleaning does not include such. Should you have any questions, please visit our FAQ page or get in touch with us using one of the methods below. Prepare your house for the upcoming season with our house deep cleaning service in London. Arrange your service by calling us on 020 3404 5102 or by filling our contact form. We are at your service 24/7. You can also use our live chat and get all your questions answered.